Are you in the mood for a fall quilt? I sure was. This is Lucy. 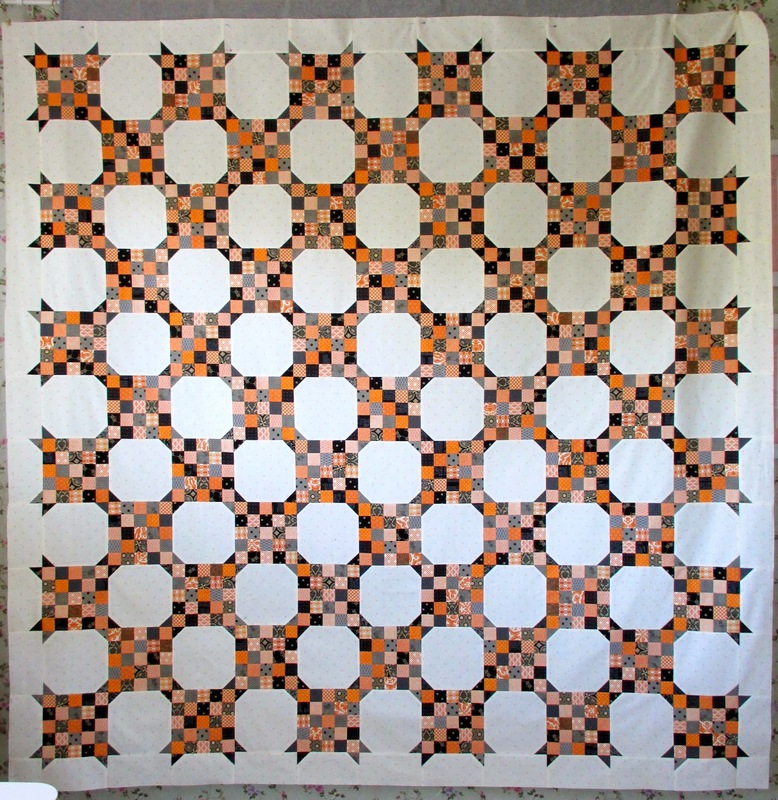 This is what you get when you piece 61 twenty-five patch blocks and 60 snowball blocks, using a variety of orange, black and gray fabric from a cadre of designers and fabric companies. It finished at 74" x 74"
It has approximately 1,889 pieces. If you would like to piece your own version of Lucy, the pdf pattern is available here, for only $3! If you would like to piece your own Lucy, exactly like this Lucy, you can, a limited number of kits are available here. This quilt was made from the kits offered by Miss Rosie's Quilt Co. Even though I normally piece fall quilts in the fall, I was thrilled to piece this sample for Carrie, the variety of oranges alone put a smile on my face. I think it will do the same for you! I love this quilt! yes I ordered a kit and look forward to whipping it up this fall :) The addition of grey in there sold me, something I would not have thought to add in. Great job! Gorgeous quilt! I ordered a kit too and am looking forward to staring this wonderful project! Great job on getting ahead of the season! Sneaky, sneaky! It looks great and the quilting is perfect. Yep, I love the spider web quilting too! I had JUST talked myself out of ordering this kit from Carrie's site and then I came over here and fell in love all over again. Just ordered my kit, I guess I needed it after all. 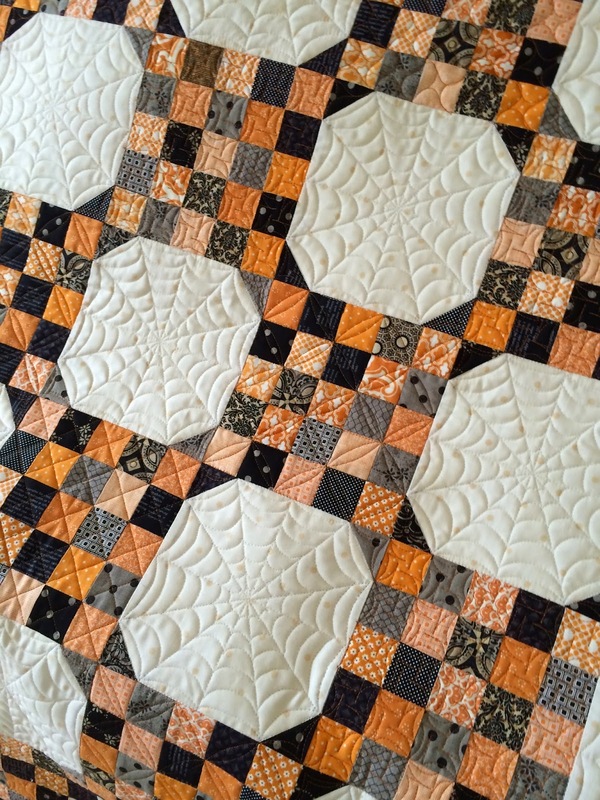 Very cool project and the quilting is perfect! I even set an alarm on my phone so I wouldn't forget to order this quilt. Its so perfectly fall and wonderfully Carrie! And your piecing is amazing! What a great fall quilt - the quilting is perfect for it! Congrats on a wonderful finish! The spider web quilting is fantastic. I missed out on the kit but will try to make this out of my stash. Great quilt, Thelma and Carrie! This is terrific, Thelma! I have my Halloween fabric up in the box on my closet shelf and I may just get it down now and get going! I absolutely love this and that quilting is just perfect!!! I really love this quilt,, being a big fan of Halloween and autumn. Your work is beautiful. Love this quilt! By the time I got your blog update (always a day after you post it, don't know why that is) the kits were gone. I did purchase the pattern, however. It will be fun shopping for the fabrics. Quick question, if you have time to answer. Did you press your seams open or to one side?